Aarsun Handcrafted custom wood bed created from solid teak wood designed in conjunction with the customer’s design and our art department. Built by our master craftsman in this 18th century design. Designed for Royalty and Handmade in India using age old traditional methods of hand tooled, hand carved, and mortise and tenon joined construction this magnificent headboard, foot board, and Wooden bed frame is a work of world class fine art designed by one of our in house senior designers under the direction of artist . 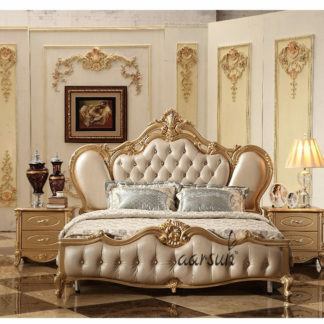 The intricately detailed high relief carvings on this floral acanthus motif designer luxury bed were painstakingly done by the hands of one in house master carver classically trained in the old world methods of fine art carving. To be recognized as certified fine art all carvings must be in the same hand technique and not gang carved or machine carved to be recognized by world class fine are appraisers as fine art. We use solid treated and seasoned wood only for our beds. These wooden beds are strong and are available with huge durability. It consist a blend of style and comfort. These wooden beds are also available in several designs. Its finest artwork and high grade wood with finish, changes the look of the bedroom. Our King Size wooden beds are available in vivid colors, grains and harnesses. We are considered some of the largest manufactures, exporters and supplier of wooden beds in India. 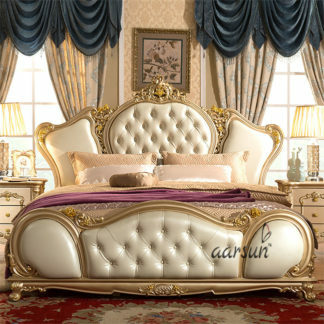 This Beautiful Indian Bed made of fine quality teak wood with deep and detailed carving. The head board of this bed is lavishly carved over solid teak wood with matching carved foot board. The head board is designed in traditional way. The head board and foot board are also finely carved in same patterns. 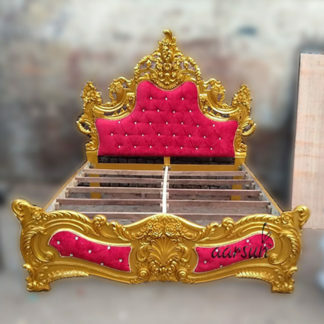 If you want a different material design in Wooden Beds, have a look at Traditional Wooden Bed,also in case you require fine carving in natural Finish, go for Handmade Wooden Beds.